As in the case of Germany, Austria has introduced several environmental zones, which have been gradually allowing entry only to more environmentally friendly vehicles. Some zones had already been introduced by 2012, e.g. in the surroundings of Vienna, while others were in 2014. Let's have a look at a list of the environmental zones in Austria, including the date of their implementation and the types of vehicles which are restricted to enter. Do you have a vehicle of the N category? 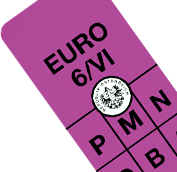 To enter the following environmental zones, vehicles must be marked with the environmental sticker, otherwise, you could be fined up to 2.180 EUR. Austria is implementing the low emission zones gradually, therefore, it is possible that there are other areas not mentioned on our list. Currently, there are no road signs in Austria marking the zones, thus we recommend going through your route to compare it with the map of low emission zones before traveling to Austria. In any case, just to be sure, you can buy the environmental badge now – it has an unlimited validity. Get Pickerl for Vienna, Styria and other cities. FREE delivery.